Phase separation in otherwise chemically homogenous, strongly correlated electron systems is a crucial parameter, leading to fascinating tunable functional properties, such as high-Tc superconductivity in cuprates and giant magnetoresistance in manganites. In the present course, the collaboration between the teams of researchers from the Institute of Electronic Structure and Laser (Greece) and the Jozef Stefan Institute (Slovenia) has been instrumental in discovering a novel inhomogeneous state of matter that is the outcome of strong conflicting interactions between magnetic moments attaining a triangular lattice topology. For this, a polycrystalline metal oxide system was grown at the laboratory under highly controlled conditions, while experimental tools based at a synchrotron X-ray light source witnessed the deviations from the homogeneous static average structure. At the same time the hidden electronic complexity of the system was revealed by local probe techniques covering a broad window of spin fluctuations (Hz to GHz). 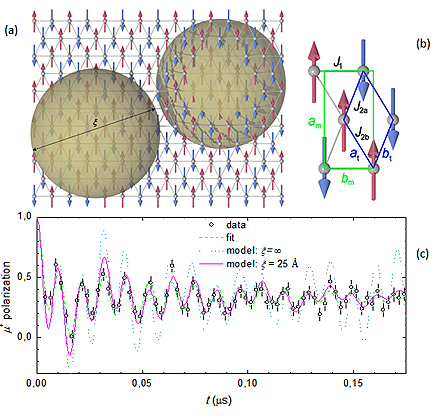 The paper in Nature Communications, entitled “Frustration-induced nanometre-scale inhomogeneity in a triangular antiferromagnet”, proposes that despite a magnet may lack charge degrees of freedom, geometrical frustration on the spin lattice can provoke the formation of nanometer scale domains in the doping-free limit. This new state that is described by Dr. Alexandros Lappas and colleagues appears to have an immediate impact on other coupled physical properties that enhance the material’s prospects for modern electronics.